Gerty Radnitz met her future husband, Carl Cori, while they were both attending medical school. Raised Jewish, she converted to his Catholic faith, and together they emigrated to the United States in 1922, where they collaborated on scientific research for many years. They were awarded the Nobel Prize for Medicine or Physiology in 1947, "for discovering the enzymes that convert glycogen into sugar and back again to glycogen." They were the first married Nobel laureates. She was the third woman to win a Nobel Prize, after Marie Curie and Curie's daughter Irène Joliot-Curie, and the first American woman. Despite co-authoring dozens of papers with her husband, she was held back for many years because of prejudice against her gender. She was not appointed to a full professorship until after winning her Nobel Prize, and even then, she received the promotion only after her husband had been made head of their department at Washington University in St. Louis. 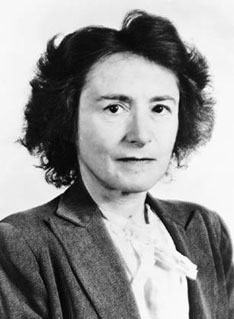 She later conducted important research into glycogen storage diseases in children, and she was appointed by President Harry S. Truman to the National Science Foundation's Board of Directors. Ill for many years with myelofibrosis, a rare disease of the bone marrow, she continued working in the laboratory until the last few months of her life.